In October, the Ripley County Community Foundation’s Board approved $45,000 in grants to be paid to eleven non-profits serving Ripley County. The purpose of these grants is to assist local groups with their quests to promote and support community service, social service, education, health, environment and art needs of Ripley County. This year, large grants were awarded as follows: $2,172 to the Batesville Adams Lutheran Church to clean and paint their steeple, $3,020 to Holton Police Department for a mobile radio, $3,505 to New Horizons for chair scales and laptops, $3,753 to St. Anthony Preschool in Morris for a Smartboard and Tablets, $3,800 to the Osgood Library for computers, $4,500 to Voices for Children for recruitment of volunteers, $4,500 to Tyson Library in Versailles for computers, $4,870 to Young Life in Batesville for A/V Equipment, $4,880 to St. Nicholas School in Sunman for flex seating, $5,000 to South Ripley Elementary for flex seating, and $5,000 to Gleaners for the BackSack Food for Kids. “2018 has been an amazing year for grant opportunities through the Ripley County Community Foundation. 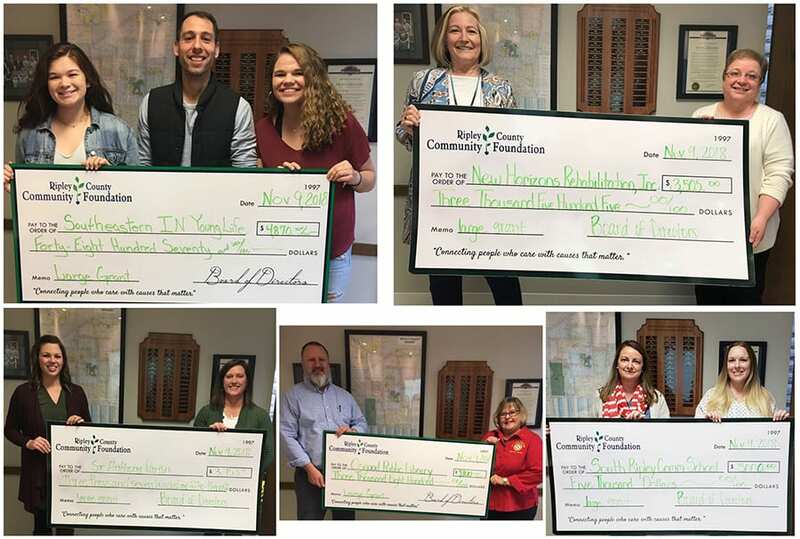 This year, through its’ community grant programs, the Foundation has awarded $10,000 in Impact Grants, $9,000 in small grants, $9,000 in proactive grants, and $45,000 in large grants” Amy Streator, Executive Director of the Ripley County Community Foundation, stated. All of the community foundation’s granting opportunities are due to the generosity of Community Granting Funds. “The needs in Ripley County are always changing; making the Foundation’s Community Granting Funds an essential resource for Ripley County residents. Since Community Granting Funds are not earmarked for a designated purpose, the Board of Directors can determine, on an annual basis, what the most pressing needs in Ripley County are, and can devise a plan to support those organizations which are best addressing those needs”, stated Streator. Currently, qualified donations to a Community Granting Fund will be matched 200% by a private foundation. This matching opportunity is available on a first come first served basis and is available for a limited time, or until all match money has been committed to other donations. Streator further noted that “if you wish to provide resources for your Community Foundation to meet future needs, assist an existing program, or even start a new program, the Community Granting Fund is the perfect choice. Your resources will be granted at the discretion of the Foundation for purposes which are meaningful and timely and meet the guidelines and policies of the Foundation.” Donations to the Ripley County Community Foundation can be made onlineor can be sent directly to the Foundation office at 13 E. George Street, Suite B Batesville, IN 47006. Community Granting Funds allow us to Connect People Who Care With Causes That Matter.